I'm so sorry. It's been almost a month since I last wrote. I have no good excuses. I just got caught up in life and the changing seasons and the idea of writing reviews just didn't seem important. My cousin Alex, a beautiful and healthy young woman, had a brain aneurism a few weeks ago while babysitting. She was in a coma for two weeks. She's doing much better but it's going to be a long recovery. I read the blog her sister and parents created obsessively multiple times a day, just waiting to hear more good news. It kind of puts everything in perspective, you know? My biggest concern right now is that I was negligent in applying suntan lotion on Sunday and got an awkward burn on one ear, one side of my nose, splotches on my feet, and awkward bursts on my chest. Alex is trying to walk and eat and fighting to get back to her old self. Sunburns and book reviews hardly seem important in comparison. I finished my fourth manuscript. This time around I tried to be more mainstream, because even though Molly and Robby adored "Loving Maribel" ("This book will change YA, I swear. I don't even know how to explain it, but I can feel it. You need to keep querying this. Someone will love it the way I (and Molly) did. An editor will love it, and sign you on. You will rule YA. In my mind, you already do." ~from Robby's email after reading it, and I think this will always be the best compliment I could ever receive... ever) it didn't get me anywhere (130 agent queries later). So I wrote something that's along the lines of what's currently dominating the YA shelves. So we'll see. I just sent my first two queries out an hour ago. Why do I always end up querying during summer, which is normally one of my favorite seasons? It's like having a constant rain cloud looming in the background. But fingers crossed that this manuscript is THE ONE. And if not, well, there are twelve more books in my head. So there's that. A few weeks ago I read Meg Cabot's "Abandon". I adored with an unhealthy passion her "Boy" series. I mean they are written in emails. How could you not love that? Of course those books were geared towards adults. "Abandon" is for teens. "Abandon" is the first in a new series of books about Pierce, a seventeen year old girl who has just moved with her mother to Florida because of an "incident" that happened back home in Connecticut. It isn't until more than halfway through the story that you find out about the incident, but what happened before the incident is more important. Pierce drowned in her pool. And died. In the underworld Pierce met a guy, John, who she had actually met when she was little. Pierce is revived and brought back to life (yay). But things aren't back to normal when Pierce wakes up, and they only get weirder as time goes on. What's more, John is also back in the living world. While Pierce is partially frightened by John and what he is she also is drawn to him. I thought the plot was very compelling and kept me turning the page, but I was also very confused in the beginning. The "incident" was only alluded to for the first half of the book and I know Meg Cabot did that because it left things in a mysterious light and made you keep reading to find out what it was, but it drove me nuts (not in a good way). Also, while I liked Pierce, I sometimes questioned her motives. Why would a girl who's terrified of this guy, who ran away from him the first chance she got, keep going back to see him? I, of all people, understand falling for the bad boy type, but it didn't seem like that was what was happening here. It just felt a little off to me. But I did enjoy it, don't get me wrong. It was a fun read. 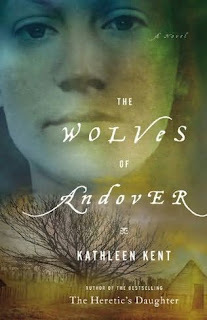 Next, I read "The Wolves of Andover" by Kathleen Kent. A girlfriend lent it to me with the tagline "It's like Outlander". Well, not quite, but I appreciated it anyways. I mean NOTHING compares to "Outlander". Let's be real here. "The Wolves of Andover" takes place in the late sixteen hundreds in Billerica, MA and London. It bounces back and forth for the first half of the book. In London we have a gang of hired men planning their trip to New England in search of the man who cut off King Charles' head. (This is historical fiction and actually based on true people and events, which is really cool.) In Billerica we have Martha, who has just been dropped off by her father to be midwive/housekeeper to her cousin's family. It's exactly as I imagine the 1600's lifestyle to be - filled with household duties, worries about food and complications of childbirth. And then there's the threat of pox and Native Americans. One of the hired men, Thomas Carrier, a Welshman, clearly has a secret past. As time passes Martha begins to uncover Thomas' past and the reason it has been kept hidden. "The Wolves of Andover" is not a fast-paced book. It very much mirrors the pace of life back then. But I enjoyed it all the same. I love historical fiction and was surprised to read in the afterword that the author is a descendant of Martha Allen, who was hanged during the Salem Witch Trials. (You can read a short bio here.) Actually, while we're on the topic, has anyone read any great fiction stories about the Salem Witch Trials? I'd love to find one to add to my list. And now I'm on to Emily Griffin's "Heart of the Matter". I wanted a good beach read (something you can put down without much thought when you're friends turn over on their beach towels and decide to start commenting on the hot guy a few towels over). Alright, well wish me luck with this bout of queries. And I'll try not to wait another month before writing again. I miss you! I hope Alex has a relatively easy recovery! Sending my love to you and your family!